I became aware of nail varnish brand Soigné towards the end of last year and I quickly added them to my 'nail varnish brands I want to try' list. I knew they did a couple of gift sets that came in beautiful boxes and when I spotted that a couple had gone into their sale I decided one would make a lovely Mother's day present for my mum. 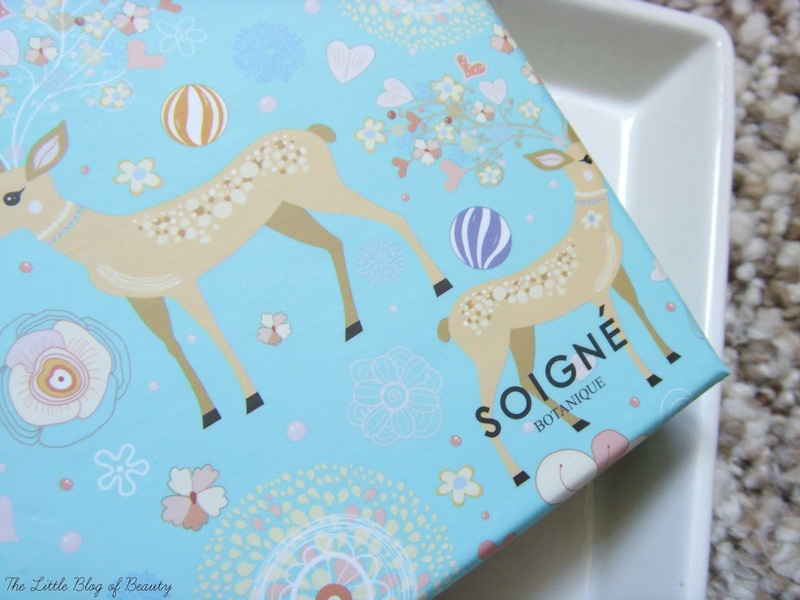 Obviously I haven't tried any of the nail varnishes, as it's a gift for my mum, but I wanted to show you the collection and tell you a little bit about Soigné. Soigné, pronounced 'swahn-yey' (I've totally been saying that wrong!) is a French brand inspired by the Parisian fashion front line. Soigné translate to 'to take care of' and that's exactly what the their nail varnishes are designed to do, to take care of your nails. Each nail varnish contains up to 85% plant-sourced natural ingredients, they're five free (they don't contains any nasties like formaldehyde), they're not tested on animals and are vegan. It took me a while to decide between the Fruit Marbles collection and the Macaron collection, which contains pastel shades inside a pink box that looks like it should contain macaron's. In each set there are five nail varnishes encased in black foam and in the case of the Fruit Marbles collection, covered with something that is like a very thick tissue paper. I'm actually really not sure how to try and explain the 'paper' used. As you can see in the picture above I had to use the box lid and one of the trays I use for photography to hold it back to take the photo as it springs back to cover the nail varnishes if you let it go. You can't pull this out as it's sealed in as part of the box as the foam doesn't come out. I don't think I really have to say anything about the box that the Fruit Marbles collection comes in, just look at it in all it's spring-like, Bambi frolicking in the flowers prettiness! The bottles are lovely and feel very high-end. They're rectangular in shape and each bottle contains 10ml of nail varnish. The brushes are about average size, not as thin as Barry M brushes but not as wide as Essie brushes. The Fruit Marbles collection contains Kyoho (described as a vibrant purple grape), Kiwi (duck egg mint green), Peche (vibrant pastel orange/peach), Pamplemousse (shocking pink) and Fraise (strawberry). The high-end feel of the Soigné nail varnishes is reflected in the price as the single nail varnishes are £11 each, putting them around level with OPI prices. The collections are usually £38 each, but as I've already mentioned the Fruit Marbles and Macaron collections are both in the sale and now just £19 each. Obviously I wanted to try one out for myself and as you get free delivery on orders over £20 this meant I just had to pop a single shade from the sale in for me and this cost £5.99. Once I've had a chance to try it out I will pop up a review. 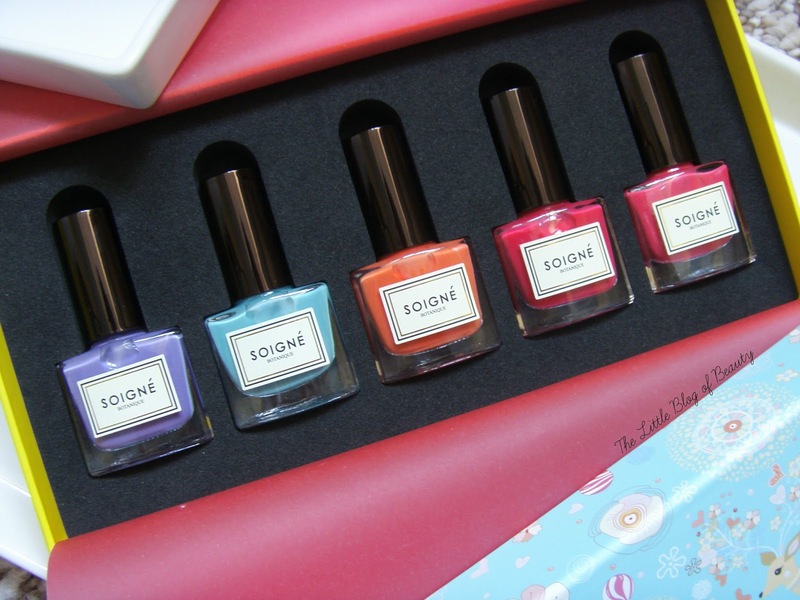 You can purchase Soigné nail varnishes from the Soigné website. 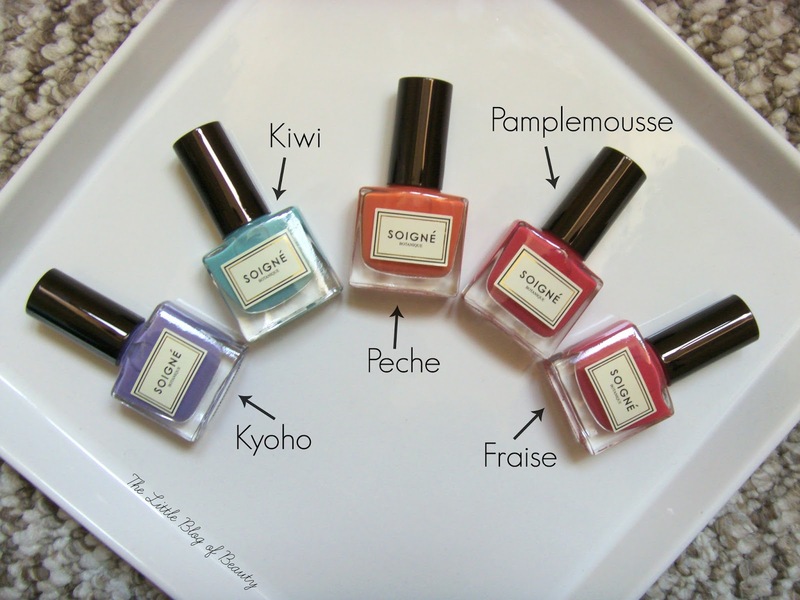 Do you like the look of Soigné nail varnishes? I've never even heard of them, wonder if they're sold in Ireland? I always love experimenting with nail colours and this set looks super cute! 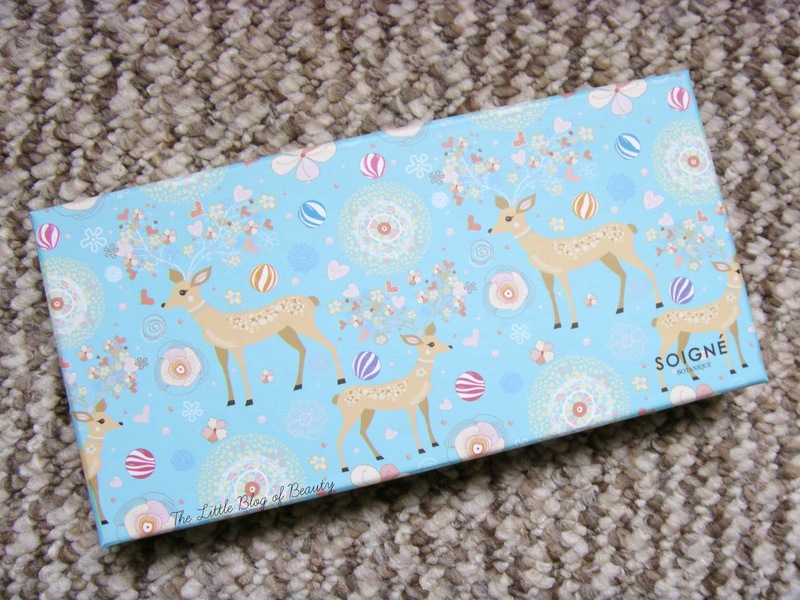 I adore Soigne polishes, and their bottles are always so cute! I had one of these in a beauty box once! They are really lovely!